Determining the minimum wage in Canada is a provincial responsibility and the minimum amount an employer must pay for an hour’s work varies from province to province. Currently, Alberta is the only province in the country to award a $15 an hour minimum to all workers, but recent changes to the Ontario legislation are designed to reach the same threshold in January 2019. Saskatchewan occupies the bottom rung on the ladder with a $10.96 minimum but is only 4 cents behind the $11 minimum in Nova Scotia, New Brunswick and Newfoundland. Employees who fall under federal jurisdiction receive the minimum wage of the province or territory where they work. A minimum wage was first introduced in Ontario in 1920 to protect earnings from inflation and encourage entry into the labour force. Minimum wage provisions are now included in the Ontario Employment Standards Act and the rate itself forms part of this legislation’s regulations. There is no mechanism, however, for reviewing or increasing the minimum wage on a regular basis. Historically, it has been both frozen and increased in accordance with the wishes of the government, the state of the economy, and intense lobbying from labour groups and other stakeholders. Just over half of minimum wage earners in Canada are between 15 and 19 years of age. Women are disproportionately affected by changes in the rate as 8% receive the legislated minimum compared to just 5.5% of the male workforce. One in five minimum wage earners holds less than a high school diploma, and the same number work part-time. Additionally, over 40% of those receiving a minimum wage work in the retail, food and accommodation industries. Between 1995 and 2003, the minimum wage in Ontario was frozen at $6.85 an hour. Between 2004 and 2010, it rose in graduated steps to $10.25 where it remained from March 2010 until January 2018. The rate currently stands at $14 but will rise to $15 an hour on January 1, 2019. The only workers in the province who continue to receive less than the stipulated minimum are liquor servers ($12.20), students under 18 ($13.15) and fishing and hunting guides ($70 per day). Those who do paid work in their own home for an employer receive slightly more than the general minimum wage with a floor of $15.40 an hour. The Ontario government has indicated that it will remain vigilant in enforcing the new minimum wage provisions. It plans to hire up to 175 additional employment standards officers and has streamlined the process of registering a wage complaint. The government has also launched an education program to ensure that both employers and employees understand and abide by their new rights and obligations. Perhaps unsurprisingly, additional wage costs are being swiftly passed along by business owners to their customers. In Ontario, the cost of eating in a restaurant rose by 1.9% within the month of January, almost twice the increase seen in other provinces. Child care and housekeeping services also rose by 5.9% in a sector dominated by minimum wage earners. A drop in overall jobs in the province in the same month, however, was unrelated to the rise in the minimum wage as these losses were in higher-paid sectors of the workforce. The new rates have also had an impact on workers who were earning slightly above the minimum wage threshold before the changes came into effect. Many of these workers also saw an increase in pay to maintain the pay differential they enjoyed based on experience or added credentials. The extent to which employees benefit from an increase in the minimum wage will very much depend on whether they are able to keep the same terms and conditions of employment they enjoyed before the wage increase. The Tim Hortons Franchise decision to reduce other employee benefits rather than pass the cost of the increase along to its consumers caused an immediate furor. The Ontario Premier accused the chain of bullying its workers and the Canadian icon is now coping with an unprecedented blow it its image, popularity and overall sales. 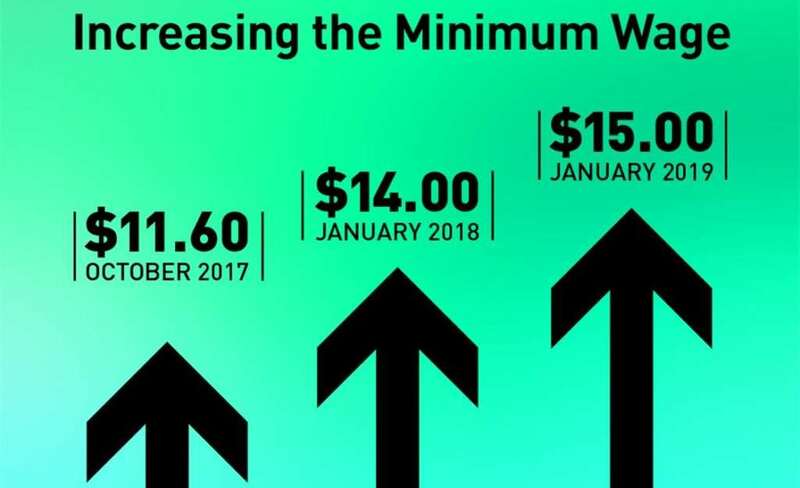 The minimum wage is set to increase again on January 1, 2019 to reach $15 an hour province-wide. The government is confident that twelve months will provide sufficient lead-time for the economy to adjust to the increased cost of doing business in Ontario. The ruling has ruffled many feathers and confused a lot of employees and employers alike since many were left confused by the ruling. It is important for all those who are in a state of dilemma to be fully aware of the terms and its implication. Time will tell if the move to introduce the new minimums is a successful one or not but for now the residents of Ontario are embracing it and continue to move ahead with their lives.